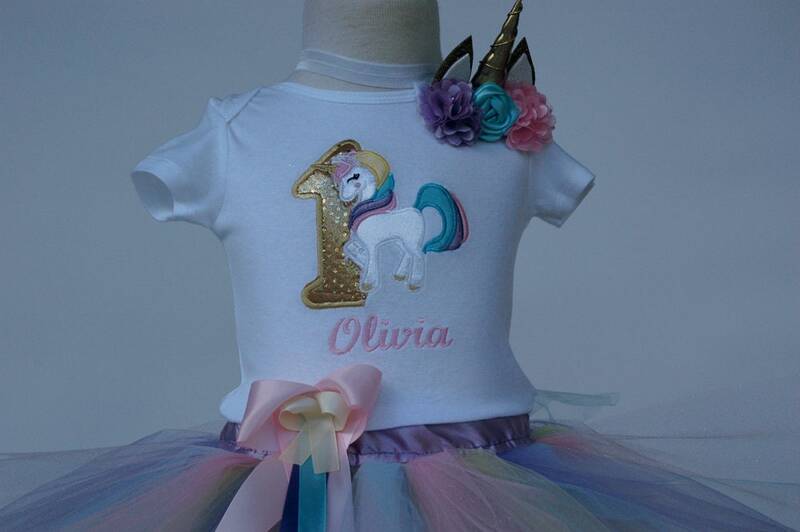 Unicorn Baby Girl 1st Birthday Tutu Outfit. Handmade. Rush orders available. Ships in 3-5 days. Can be customized to any Birthday Year. Custom orders welcomed. Tutu will be made to order. Made with high quality purple, pink and sparkle pink tulle. Tutu will fit very comfortable sewn at the waist with a beautiful pink satin fabric. Long or short sleeve available at checkout. Embroidered onesie or shirt. Personalized with your baby's name. This outfit served its purpose and then some! It was used for First Year Pictures and First Birthday! It survived cake smash and all! They Quality is amazing. And the attention to all the details made my heart smile. Also let me mention I needed this quickly and my requests were more than accommodated! Thank you for your spectacular service and products! Absolutely darling! Great quality thanks! If you would like a custom order please contact us with as many details as you can. All of our sets can be customized in color. If you like to exchange pieces from one set to another that can be done as well. Additional charges may apply. Current shipping time is 2-3 days. Rush orders are available. Please message us for more information. Overnight shipping available at extra cost. Our tutus fit just above or just bellow the knee if you have a special request please message us.